Until mid-2011, All-Clad had outsourced to a hydroforming shop 25 percent of the pots and pans it makes. Much of the outsourced metalforming comprised five of the firm’s biggest hitters, which exceeded the company’s inhouse capabilities based either on blank size or tonnage. After a concerted and highly successful effort made by the company’s manufacturing operations in Canonsburg, PA, to move from batch manufacturing to one-piece flow, completed in 2010, the firm set its sights on bringing production of the hydroformed products inhouse. But rather than stick with hydroforming the large blanks—as large as 24.25-in. dia. used to make a 12-quart stock pot—the firm turned to deep drawing in a hydraulic press. 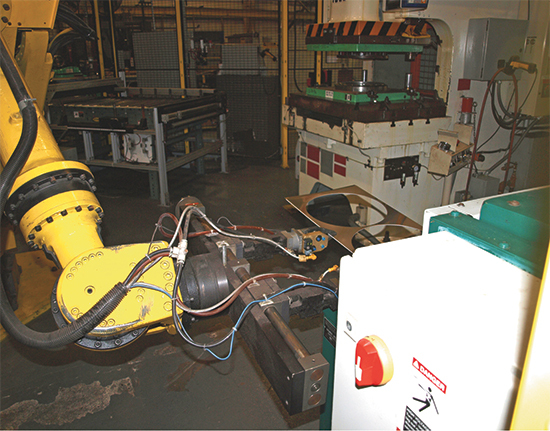 All-Clad’s blanking cell stars a six-axis Fanuc robot, a five-roll straightener (top left), a 150-ton 30- by 36-in. Aida mechanical press and a 4-ft. shear (foreground). A series of resistance welds along one edge of the bonded three- or five-ply pack (master blank) help to hold the material together. After the robot picks up the straightened pack and indexes it through the blanking press, it moves the web (shown) to the shear to cut a a ¾ in. strip where the welds are, allowing the firm to maximize scrap value. 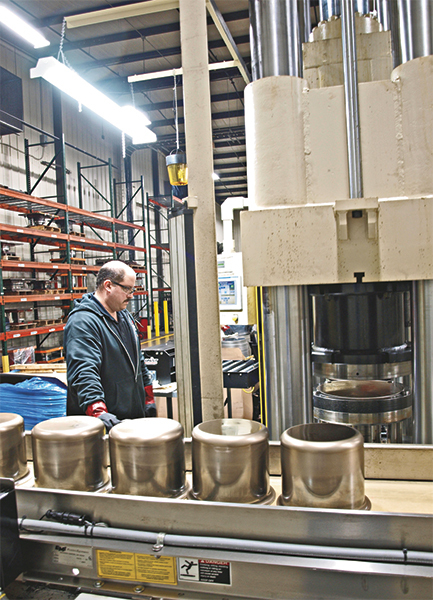 Boost press capacity it did—with the acquisition of a four-post 560-ton hydraulic press from Greenerd Press & Machine Co., Nashua, NH. The press joins two other hydraulic presses in the firm’s forming area, 160- and 120-metric ton models. How much blank ironing occurs? On a 12-quart drawn stockpot, for example, the hydroforming blank measured 24.25-in. dia. Now, deep-drawing the part (8.375-in. draw) in the Greenerd press requires only a 20.75-in.-dia. blank. The bottom thickness of the part remains the same as the blank, while the sidewalls thin by nearly 20 percent. At the new Greenerd hydraulic press, DeHosse forms 7-qt. stock pots; a 7.75-in. draw reduces a 17.75-in.-dia. blank to an 8.4-in. dia. pot. The press measures 36-in. left to right and front to back, and boasts an adjustable stroke to 40 in. and a 16-in. cushion stroke. As if making an 8.375-in. draw on a 20.25-in.-dia. sheetmetal blank isn’t tricky enough, consider this: All-Clad’s pots and pans are fabricated from clad blanks—either three- or five-ply (see sidebar). A three- or five-ply pack (master blank) as large as 2 by 4 ft. can be quite heavy and challenging to manipulate. As such, All-Clad had grown weary and concerned over numerous strains and sprains experienced by operators plagued with indexing the packs along two- to four-out transfer blanking dies. In 2010, the firm automated the blanking process by installing a blanking cell starring a six-axis Fanuc S-430i robot (104-in. reach). Other cellmates include a five-roll straightener, a 150-ton 30- by 36-in. Aida mechanical press and a 4-ft. Tennsmith shear. Blanks feed from the press at up to 60 strokes/min. “We change blanking dies as many as three times/day,” adds DeHosse, who notes that changeover time has been reduced to less than 30 min., compared to approximately 90 min., thanks in part to the recent addition of a magnetic upper bolster. Before the blanks find their to the hydraulic-press department, they’re processed through an eight-station automated deburring operation. To build up its clad packs of master blanks, All-Clad brings in coils slit to the various widths needed to match the required blank sizes, which run on cut-to-length lines to produce the required strip lengths. Strips as large as 48 in. long by 22 in. wide are then layered and processed on a two-stage rolling mill into clad master blanks, referred to as “packs” at All-Clad. For a three-ply blank, Type 304 stainless steel comprises the inside cooking surface and a magnetic stainless-steel grade comprises the outer layer. Sandwiched in between is a layer of aluminum. Five-ply packs include two additional layers of aluminum and a second layer of magnetic stainless. Each pack yields two to four deep-draw blanks. Since the move to deep drawing the clad blanks, DeHosse and his cohorts have spent considerable time and resources optimizing the cladding process to improve bond strength. 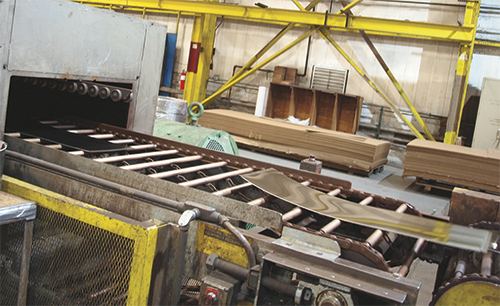 Even as overall scrap rate since the move to hydraulic presses is far below that of hydroforming, “and the blank-size reduction makes the move to deep drawing a no-brainer,” DeHosse says, the quality-control efforts made in the cladding operation have yielded marked and measurable improvements. Press specs: 36-in. left to right and front to back; adjustable force from 112 to 562 tons; adjustable stroke to 40 in. ; ram speed to 912 in./min. on close and 95 in./min. during forming; cushion force adjustable from 28 to 280 tons, with a 16-in. stroke; 20-ton ejection force; and ram-mounted knockout force to 30 tons. Rather than design the press with an integral blankholder, each tool features its own blankholder. And while DeHosse says that the drawing process would function similarly whether the blankholder was mounted to the press or tool, there is one distinct advantage to having it in the tool. Also included with the press: a bar-code reader that operators use to scan the dies and call up the appropriate forming recipe; and light curtains across the front of the press with mirrors along the back to reflect the curtain and completely guard the press perimeter. Before the blanks feel the pressure, they’re run through a Unist SPR-2000 Sproller lubricant applicator, which applies a controlled layer of heavy-duty chlorinated draw lube (Prodraw 150, from Wallover Oil Co.) top and bottom. Triple-action hydraulic presses feature several cylinders that can perform multiple operations during one setup, often the case when forming cookware as well as aerospace components and other products. The three actions include the main punch, cushion and blankholder platen. The presses can help to eliminate additional tooling requirements while enabling manufacturers to produce more uniform components, rather than having to manipulate the part several times with different tools. A triple-action press also provides complete control over the various ram movements. The ability to set and manipulate parameters will result in the most efficient cycle possible, for a better-finished part. Parameters can include draw speed, reverse tonnage on the cushion, and when to actuate an eject function. Depending on the application, the press can be custom-designed to meet specific requirements. Consider the examples below. 1) For some applications, including cookware, a triple-action press includes a main slide (where the tooling is mounted), a knockout/eject mounted on or above the main slide and a cushion/eject mounted below the press bed. This design proves useful for drawing a deep pan—the part draws over a punch but sticks in the upper tool when the main slide retracts. At that point, the knockout/eject can keep the part down on the punch or strip the part from the upper tool. Here, the cushion/eject is used primarily to provide pressure on the material so it can be drawn without wrinkling or tearing. By altering the press design and mounting the punch to the main slide, the cushion/eject will provide blankholding force during the downstroke of the main slide. The cushion/eject then would be used to push the part up and off of the lower tool or punch. 2) For other applications, a triple-action press includes a blankholder slide—which allows a higher-tonnage ram to run through the middle of the press—as well as a bed-mounted cushion/eject. The press can feature any combination of cylinders to provide power to form, punch, coin, draw, etc. in one setup, and finds use in the manufacture of jet-engine cowlings. The main slide serves as a blankholder platen, and applies adjustable tonnage to the material as the main ram (located in the middle of the main slide) descends to form the cowling. The cushion/eject can be used to push the part up and out of the lower tooling. 3) A triple-action press also can allow for a reverse draw to, for example, produce a “wave” form on the bottom of the part. In this case the main punch descends as the blankholder clinches the material. When the main ram reaches its full depth, it holds its position while the pressurized cushion/eject cylinder pushes back against the main ram. This action produces a small form or “wave” on the bottom of the drawn part. Here, the cushion is used on the downstroke to help draw the part and reverts to an eject to produce the form. After deep drawing, parts travel by conveyor (part of the one-piece flow setup installed in 2010) to a hydraulic trim press, then on to CNC lathes for edge finishing. They then route to a washing system (supplied by Walsh Manufacturing), which in 2010 replaced three separate wash lines— “One more step in the process to implement single-piece flow,” shares DeHosse. See also: Greenerd Press & Machine Co., Inc., FANUC America, Inc., Aida-America Corporation, A Subsidiary of AIDA Engng LLC, Unist, Inc.